A team of Randolph College students traveled to Virginia Wesleyan College this weekend to debate issues of “U.S. Presidential Election Politics” in the Virginia Foundation for Independent Colleges’ (VFIC) 18th annual statewide collegiate Wells Fargo Ethics Bowl. 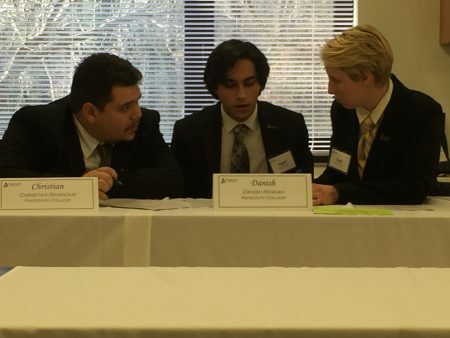 Randolph’s team, which consisted of Katya Schwab ’17, Danish Roshan ’18, and Christian Ridenour ’18, competed against teams from 15 leading independent colleges and universities across the state and deliberated issues such as ethical obligations of campaign staff, presidential candidates, and delegates when faced with conflicts between personal and political commitments. Philosophy professor Kaija Mortensen and political science professor Vincent Vecera served as the Randolph team’s faculty coordinators. (From left) Christian Ridenour ’18, Danish Roshan ’18, and Katya Schwab ’17 deliberate during the 2017 VFIC Ethics Bowl. 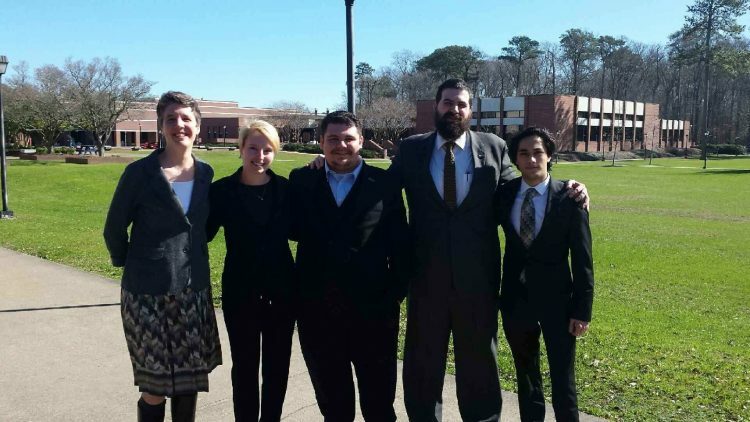 Randolph went head-to-head versus teams from Randolph-Macon College, Shenandoah University, Hollins University, and Bridgewater College, and the judges were split in their decisions about all four debates. Hampden-Sydney College was the overall winner of the 2017 Ethics Bowl. Mortensen said each member of Randolph’s team contributed and was recognized for his or her unique skills. Ridenour, a political science major, was praised by the judges for his effective strategy of using rhetorical questions to engage the audience and focus their attention on the key points of the argument. Roshan, an economics, economics, and mathematics triple major, excelled at asking the other teams’ members incisive, challenging questions about their arguments. And Schwab, a philosophy and communication studies double major, was also praised for consistently and confidently articulating solid arguments founded on meaningful ethical principles. Mortenson said preparing for the Ethics Bowl gave the students an extended opportunity to develop both their public speaking skills and their ability to construct and analyze arguments. “The Ethics Bowl grants students the opportunity to learn how to civilly discuss ethical issues with others and work together under time pressure to defend their principles and values,” Mortensen said. “This experience also helps students better recognize the ethical stakes and consequences of the actions of others as well as their own. Founded in 1952, the Virginia Foundation for Independent Colleges is a nonprofit fundraising partnership supporting the programs and students of 15 leading independent colleges in the Commonwealth: Bridgewater College, Emory & Henry College, Hampden-Sydney College, Hollins University, Lynchburg College, Mary Baldwin College, Marymount University, Randolph College, Randolph-Macon College, Roanoke College, Shenandoah University, Sweet Briar College, University of Richmond, Virginia Wesleyan College, and Washington & Lee University. For additional information on the VFIC, visit www.vfic.org.